A friend of mine gave me an osage orange walking stick that was in serious need of a handle and a way to protect the tip from damage. For those that are not familiar with osage orange, it is a tree that grows in places like Texas and is a very hard wood with thorns that will rip you up. It also produces what we used to call horse apples or hedge apples. The osage orange is also a prized wood for bow construction. In places where it grows, you will also see it used quite often for fence posts since it doesn’t shrink or rot very easily. 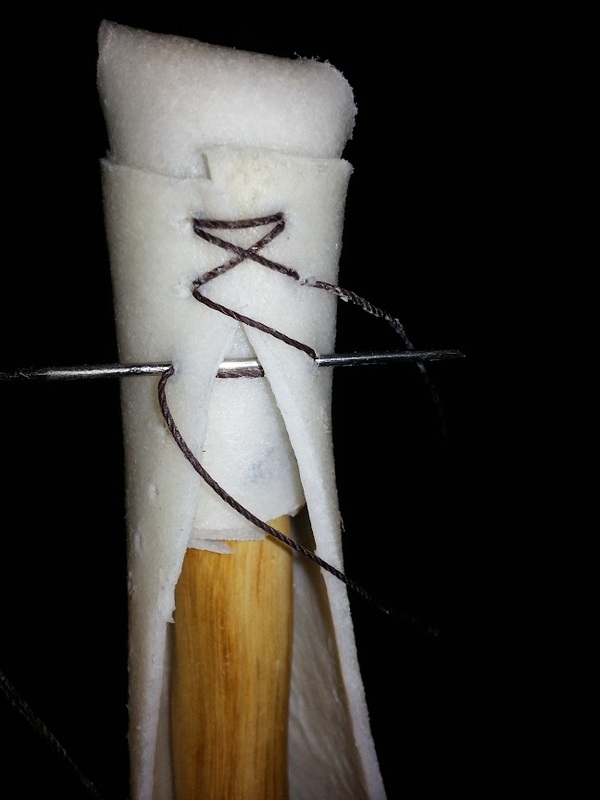 Since I had a blank slate from which to work from, I decided to try my hand at using rawhide. I have never used it before and am quite clueless about the process other than soaking, stretching and sewing…. That is about the detail and extent of the knowledge I had about it so I set out in search of some instruction. Library you ask? Nope. Elderly gentleman that looks like Davey Crockett? Nope again. Local books store, Backwoodsman magazine, or some obscure Foxfire volume? No way….. Youtube! 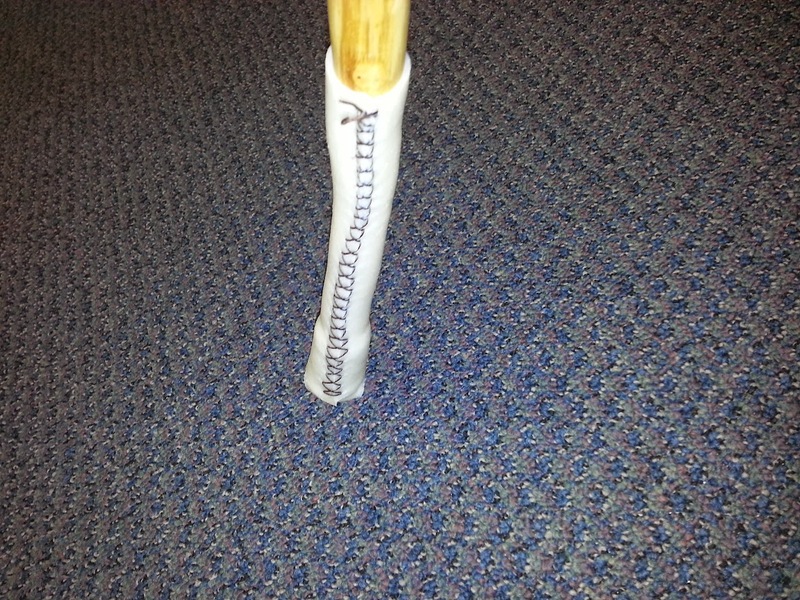 So step 1 in the process was to find rawhide and some nice looking thread to use to sew it all up. On my way home last night the whole Interstate was actually closed down, thus forcing me to find an alternate route home. This made me think that I was suddenly destined to get my walking stick finished and I took the opportunity to stop by Tandy Leather. $45 later, I was back in traffic and slowly crawling home. 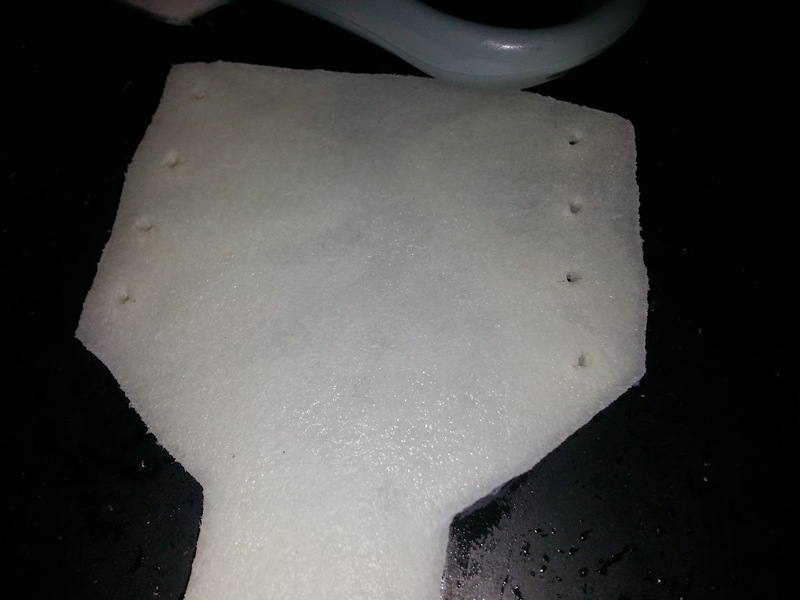 The next step is to make your template/pattern and cut out your rawhide so you can soak it….. I bypassed the pattern thing and just cut off a few chunks to soak. After a couple hours sitting in water it was soft enough to work. At this point I eyeballed the sizes and did some chopping. Once I had a rough guess as to what shape and size I needed everything and it was all chopped accordingly, it was time to punch some holes and get ready for sewing. 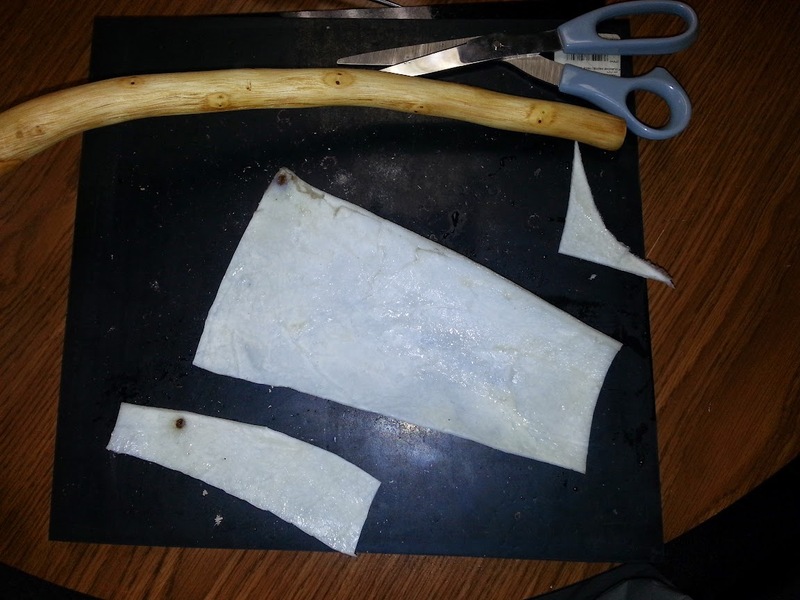 I found that rawhide is so forgiving due to its stretchy nature, it is actually quite annoying to work with at times. It gets slimy, pulls and stretches at the wrong times, and is difficult to judge the shrinkage and contraction as it dries. It really is quite fun. Once the holes are poked you just start stitching it up. I used a cross stitch pattern that I have seen several sheathmakers use for rawhide. Rawhide is much easier to work with than leather. There seems to be an inherent allowance for looser tolerances with rawhide than people allow with leather. I like this as well. Once everything was all stitched up it looked like this. One thing I need to figure out is how to tie off the ends of the thread. I just tied and cut for now, but I have a feeling that it will eventually pull loose and I will end up having to redo it. To help this not happen with the handle portion I did a sort of end cap thing. Once I figure out how to professionally tie it off, I will go back and do my version of professionally tying it off. My version is much goofier looking, but will work. I will also research how to dye rawhide and go back later to make it a little less…… Uh… Rawhide like? Not sure how to describe it, but it just kind of glows at this point. For anyone that starts off on one of these projects, I suggest you do some Youtube research and then look at what some professional leatherworkers build. Contrasting the amateurs online with professional pieces helped to make me understand the idea of crossstitching and the sort. Good luck to anyone that gives it a try. It is really quite easy and isn’t as big of a hassle as I originally thought it would be. 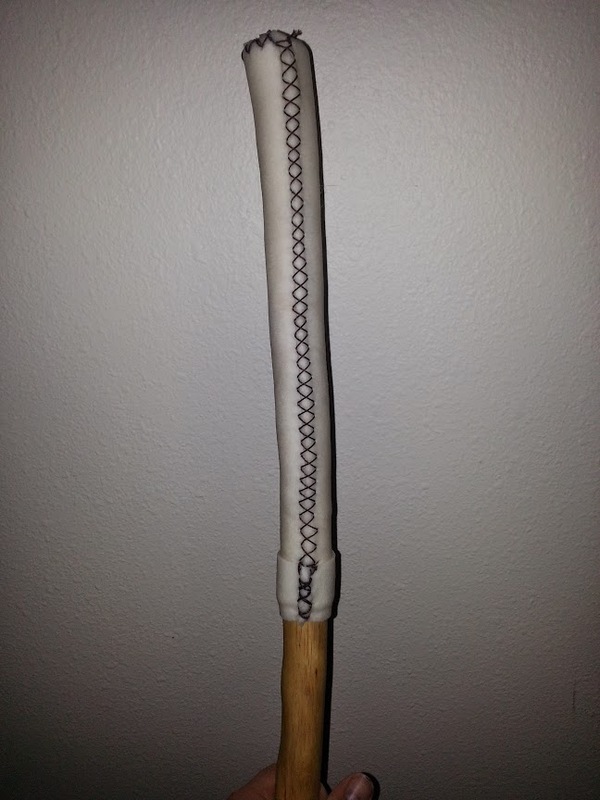 This entry was posted in DIY Projects and tagged diy, diy projects, rawhide, walking stick on March 27, 2015 by Woodsbum.